Do you sometimes feel like you’re drowning in paperwork? Does it feel like your piles of papers keep multiplying and appearing all over the house? You’re certainly not alone. Paper is constantly streaming into our households often via the mail or from our kids’ schools. We can convince ourselves that we’re organized by putting it into nice neat piles, but that doesn’t count. In order to properly manage our paperwork, we need to have a plan and be a bit ruthless. Read on for some tips on paper organization and how to create strategies to banish those pesky piles. 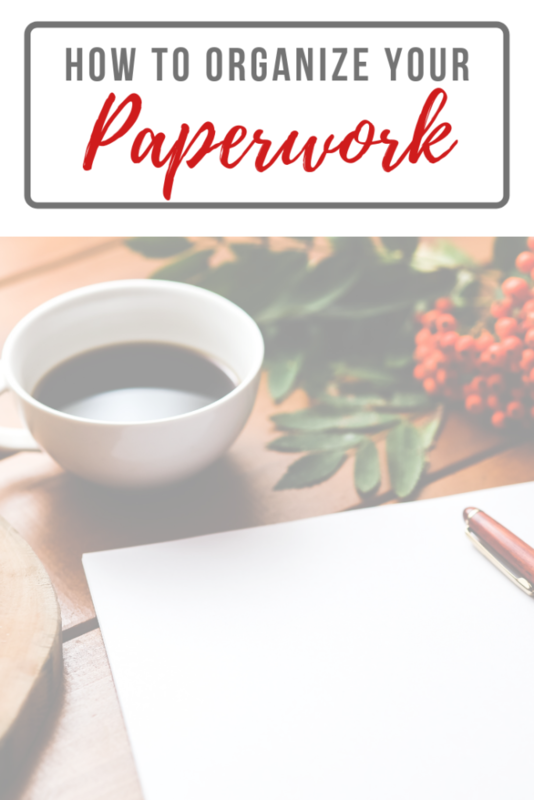 Why do we need paper organization? Apart from the obvious unsightly clutter, it’s important to organize your paperwork for many reasons. You may have a meeting with a financial planner or attorney and need to be able to grab certain documents. If you become ill or incapacitated, you’ll want to make it easier for loved ones to step in and find documents such as health insurance policies and medical records. And with tax season just around the corner, you’ll need to lay your hands on those all-important receipts and statements. 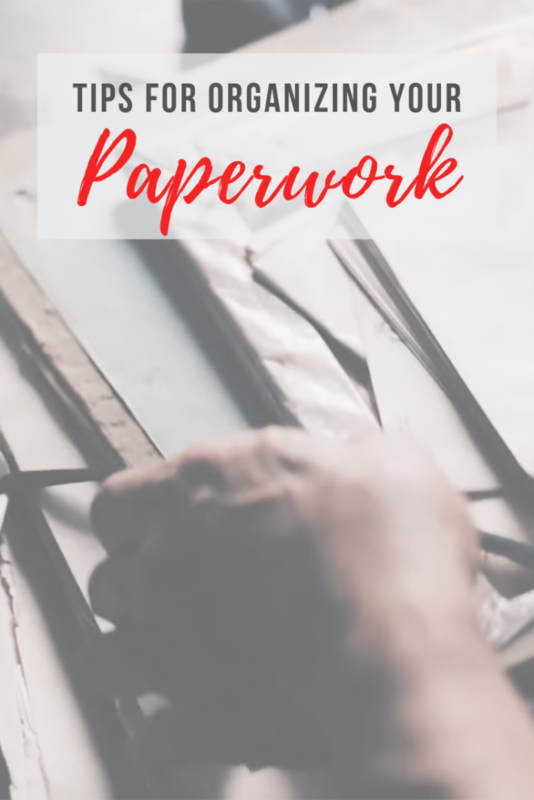 If your paperwork is in chaos, this could leave you tearing your hair out! Hold your horses! You can’t organize your paperwork until a) you know what you have and b) you have gotten rid of all the junk paper that you don’t need. Probably around 80% of the paperwork that piles up in our homes is unnecessary, but we convince ourselves we should keep it. We find it so easy to shove everything away in a box, saving it to be sorted later, or we put it into a pile to look through at some point. So go and grab a basket or box, walk through your entire house and gather every single piece of paper you can find. You’ll be surprised at how much you’ve managed to hide away, shoved into drawers and cupboards, under notebooks and even on nightstands. You’ll likely end up with a mountain of paperwork by the end of it, but don’t worry, most of that you will toss out! Once you’ve gathered everything into a big pile, you need to set aside some time and plenty of space to blitz it. You can start by sorting it into 3 groups. The largest will be for trash or better still recycling. Most of what you go through, you’ll quickly realize is just junk – catalogs and old magazines, leaflets, newsletters, documents printed from the Internet or empty envelopes. You’ll be amazed at what you’ve been clinging onto! The second largest group you will be sending to the shredder. Basically, this is the same as the first group, as in you don’t need to keep it, but it’ll include documents that contain personal information such as bank statements and ATM receipts. 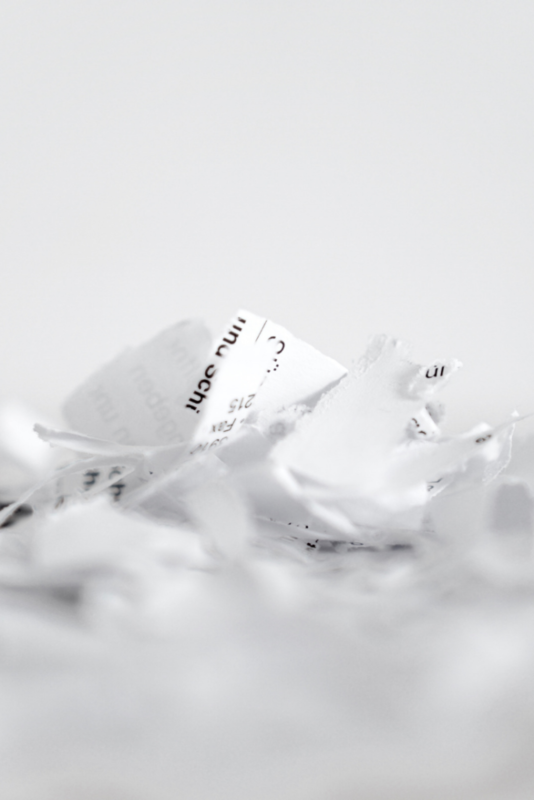 Given the very real threat of identity theft, anything that shows your name, address, phone number, social security number, and bank details, you’ll need to destroy first and then recycle. The last group that you have left should be the smallest of the three. This will be much more manageable, and by this point you should be congratulating yourself on your achievement so far! Okay, now you can start organizing your paperwork into categories and it should be a much less daunting task. Some colorful post-it notes to temporarily label the groups may come in handy for this. Before you start to organize the remaining paperwork, try to figure out how long you need to keep certain documents. For example, some things such as ATM and bank deposit receipts you’ll probably only need to keep for up to a year, or at least until you’ve reconciled them with your bank statement. But documents such as birth and death certificates, marriage licenses, wills, and social security cards you certainly need to keep forever. And somewhere safe for that matter. It might be worth your while investing in a safe deposit box for these items. 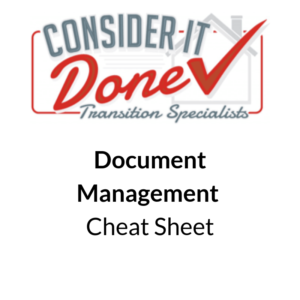 Here is a handy cheat sheet I created Document Management Cheat Sheet to help you figure out how long you should keep certain documents. You may find you can toss out a few more papers if they have passed their ‘keep for’ period. Now’s a good time to purchase files and folders, maybe in different colors to help with categorizing your paperwork in a way that works for you. You could assign house related filing to yellow files, family related to red and finance related to green – just as an example. You may find you need more color groups depending on your circumstances. It can make finding things so much easier, as you immediately narrow down your search to within that particular color. 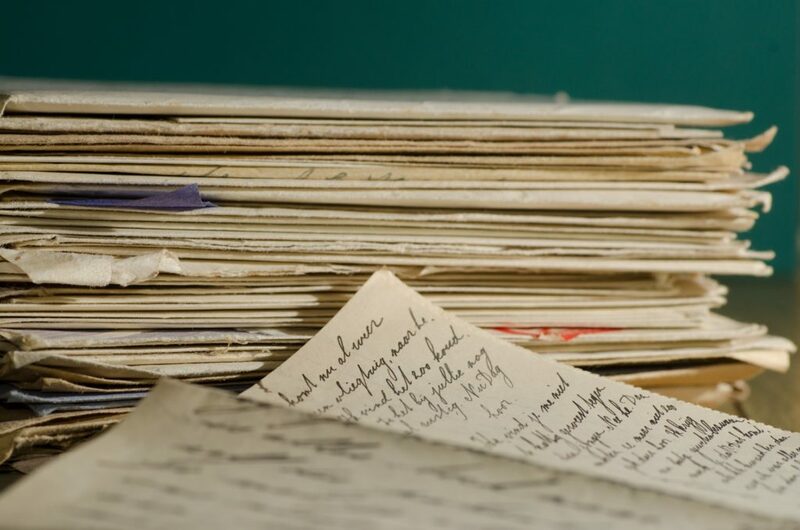 You may have to create a miscellaneous box or file for items that don’t necessarily fit into the regular filing categories, for example, your kids’ school artwork or sentimental letters. It’s a good idea to keep these somewhere safe and separate from the regular filing. Once you’ve streamlined your filing system and sorted the backlog of paperwork, you need to then stay in control. Easier said than done, as there’s no let up in the constant flow of paperwork coming into our homes. A home command center is a good idea for sorting paperwork and mail as soon as it arrives. You can set up a ‘to do’ basket for everything that needs your attention. A ‘to file’ basket where you can put everything that needs to be stored away. For things that don’t need action but you need to be aware of, a ‘to read’ basket will come in handy. For everything else you can create a ‘to dump’ basket so it’s ready to recycle or shred. These are the main zones that you might have for sorting your mail. However, you may decide to go further and create baskets for kids school papers, a calendar, maybe even a pinboard. Having this sorting area or command center should make your paperwork organization much more manageable. The biggest problem seems to be junk mail as we have catalogs and leaflets bombarding us from all directions. You can contact the Direct Marketing Association and request to be listed as ‘do not mail’. Also, you can request to opt out of receiving offers from insurance companies and the like by going to OptOutPrescreen.com. This won’t stop everything, but it may help reduce the amount of junk arriving in your mailbox. Another handy tip for reducing paperwork is to try and switch to receiving as much as possible online. For example, when you buy something in a store, ask them to email you the receipt rather than printing it. Or you could request that your bank sends you statements online rather than through the mail. If you are reasonably tech-savvy, you could scan and save documents to your computer. You can then just toss the original copies. We have talked about this previously with regard to photographs and how to digitize them to reduce clutter. This would work for things that don’t need to be physically kept like annual statements for pensions and loans, and vehicle repair invoices. I think we can all agree on how important it is to organize our paperwork. With a little bit of thought and planning, you should be able to come up with a great system. One that gives you peace of mind and helps you to know exactly where everything is. Remember: get rid and get organized. The recycle bin and shredding machine will soon become your best friends. 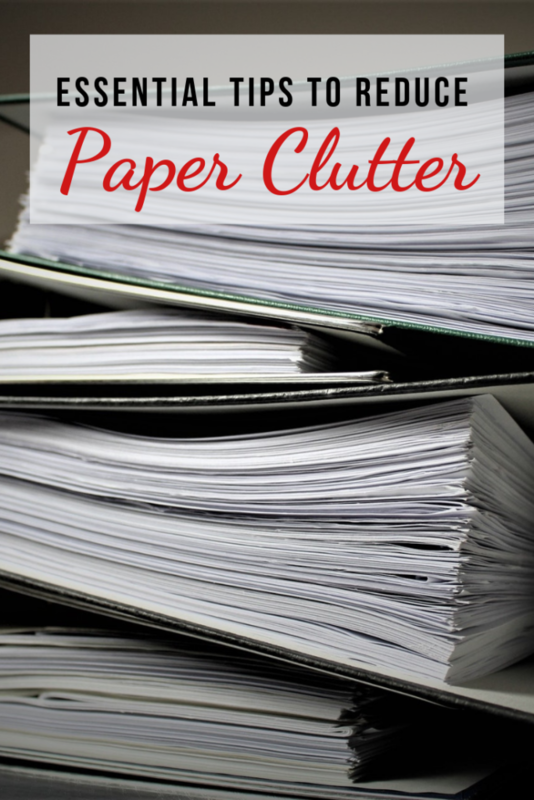 Your house will be free from paper clutter before you know it!